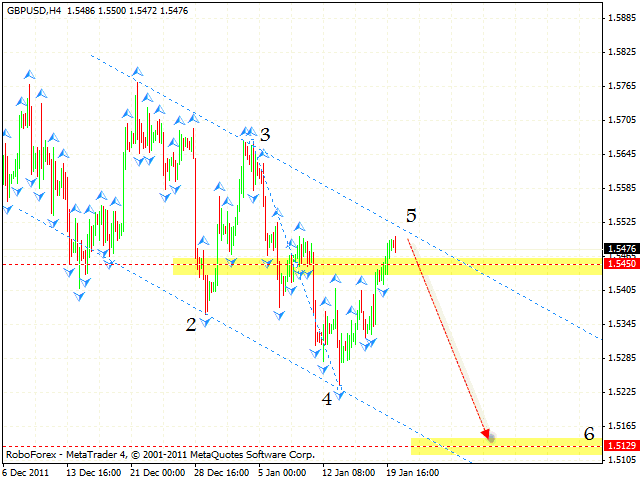 In case of the EUR/USD currency pair a very serious correction has taken place lately. Currently the price is testing the descending channel’s upper border at the daily chart, and this border is the last resistance level for the descending trend. 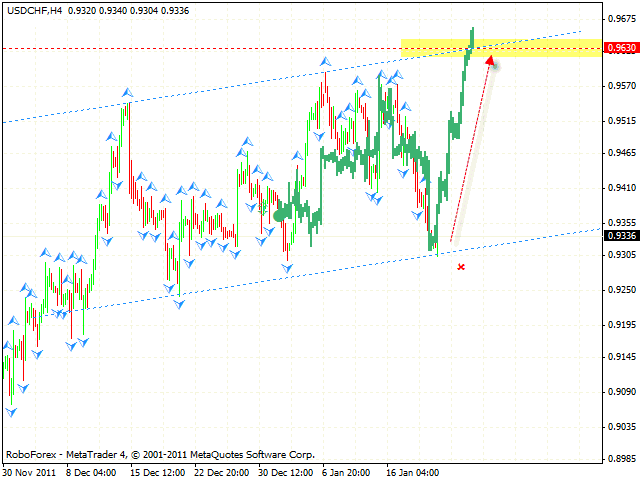 If the price leaves the channel, we should expect a very strong rising trend to start. 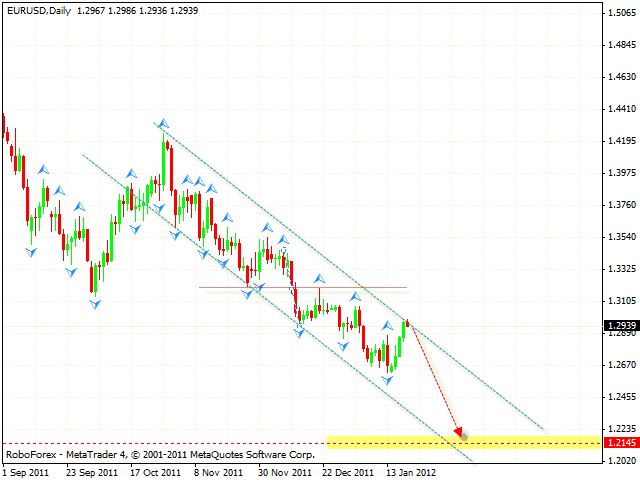 At the moment there is still a possibility that Euro may continue falling down with the target in the area of 1.2145. One can consider selling the pair with the tight stop. Pound also continues moving inside the descending pattern. At the moment the price is testing the area of the 5th pivot point, which is expected to be a starting point of the fall, and the pair may reach new local minimums. The final target of the pattern is the area of 1.5129, one can consider selling the pair with the tight stop at current prices. If the price breaks the upper border and leaves the descending channel, this case scenario will be cancelled and we should expect Pound to continue growing up. Franc also continues falling down. At the moment the price is testing the rising channel’s lower border (which is a support line here), we should expect it to rebound from the line and start moving upwards with the target in the area of 0.9630. If the price breaks the channel’s lower border and reaches a new minimum, we should expect the pair to continue falling down. 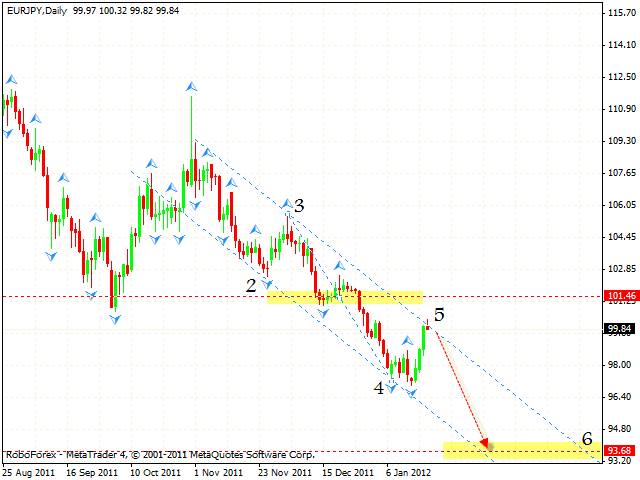 The EUR/JPY currency pair keeps moving inside the descending pattern, the target of the fall is the area of 93.68. At the moment the price is testing the channel’s upper border (it is the area of the 5th pivot point here), which is expected to a starting point of the descending trend. One can consider selling the pair with the tight stop. If the price leaves the channel, we should expect it to start moving upwards.